These include the Black Wall, home of the Caribbean's rarely seen black coral, while another noteworthy spot off the west coast of Puerto Rico is Isla Mona. Known as the Galapagos of the Caribbean, it is home to sea turtles, dolphins, and various species of rare marine life. 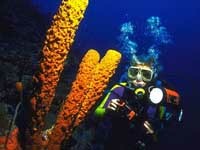 Puerto Rico is regularly seen as one of the top five destinations for shore diving and the island is a mainstay in top-20 lists for overall diving expeditions. For visitors looking to get close to the water, but not necessarily submerged in it, Puerto Rico offers various other water sports such as world-class surfing, windsurfing, sailing, kayaking, and deep-sea fishing.